One day, a lion was sleeping under a tree when a tiny mouse came scampering up and down on him. This woke up the lion. The lion was very irritated by the mouse. The lion put his paw on the mouse and open his mouth big to swallow the mouse. The lion laughed out a loud and says, “Do you think a mouse can help me?” The lion sympathized with the mouse and he let the mouse go. One day, it happened that the lion was caught in a trap set up by the hunter. The hunters didn’t harm the lion because the king wants the lion to be brought to him alive and unharmed. At that moment, the mouse was passing by the way. The mouse saw the predicament the lion was in and decided to return a help back to the lion. 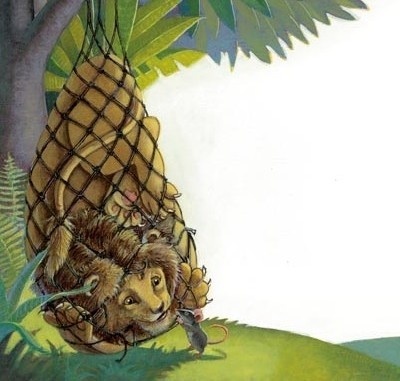 The mouse scampers towards the lion and gnaws away the net that bound the lion and the lion was finally freed. The lion finally believes that the mouse can help him. After the lion had thanked the mouse, he went on his way. Small friends can be a great help to you.